Having been head over heels for Reverence For Fallen Trees, the first album by Holland's The Black Atlantic, I was pretty sure I would love this album as well. And I do. Geert, Simon, Kim and Mathijas have stretched their sound in more aggressive and louder ways while still maintaining the beautiful melodic core that makes the band's sound pretty unique. 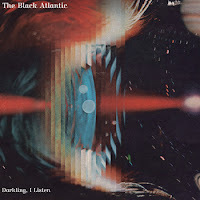 Darkling, I Listen by The Black Atlantic The waltz timed "Aftermath (Of This Unfortunate Event)" is the first track and has the feel of being recorded it a cavernous old church abbey. "Our silence hides nothing in this truce before sleep. One can hear the creaking of ghosts of no shape or hue. I'll admit i've used all the wrong words to position myself," Geert sings with resignation. "The Flooded Road (Built on Sand)' is a doo-wop inspired soulful song where Geert sings, "She waits for me there clutching a child. Love was lost in the ferns and rekindled in the slope". The music has a throw back old soul sound, the types of songs people make babies to. The drums and percussion on the title track really stood out for me. They add a bit of harder element. Speaking of jazz influence, on "An Archer, A Dancer" the jazz timing makes for quite a dramatic flourish. A nice counter balance to Geert singing repeatedly, almost as a mantra, "I am rudderless and adrift tonight. My pen, in sinews of the ink, dries in the maelstrom To span time." Overall, there are a lot of slight touches, many of them jazz based that make this album full of beautiful and unconventional pop songs. Yet again, they have made an album that I can't just put on to listen to one track. I am really excited to see what direction their music takes next. I was fortunate to help get the guys some gigs here and to hang out with them as well. I was really happy for them when their song "Dandelion" was used for the Kindle Fire commercial that came out just before Christmas last year. Then that song was on Amazon's best selling singles list shortly there after. Great hard working guys, who deserve the exposure they are getting. Thanks again to the guys for the awesome free album. To get the lyrics for this post I consulted the best source... the inside of their vinyl album cover. It's a beautiful package and one you will want to consider ordering so you can enjoy it as I do . You can order it HERE. Having had their first album download hundreds of thousand of times led The Black Atlantic to a wide exposure that led to that commercial placement. This is exactly what I discuss with bands all of the time. Sometimes it's hard to put an album up for free and still have to pay the production costs out of pocket, but there is something to be said for getting it to as many people as possible.